High performance extraction products for every application. The only sure-fire way to ensure a perfect result in any carpet cleaning job, is to use a high quality emulsifier. 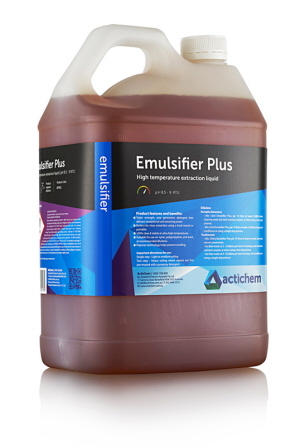 Through years of experience, Actichem have developed a range of emulsifiers that cover every base. The Actichem emulsifier range has been designed to work hand-in-hand with the pre-spray range for a perfect finish. Actichem Emulsifier Plus is a high performance extraction liquid. A premium extraction/rinse solution which provides ultra high stability, powerful cleaning and polymer anti-resoiling action. It has a triple strength, new generation carpet extraction detergent which delivers exceptional soil removing power. It has 100% clarity and stability ultra high truckamount temperatures. It is suitable for use on nylon, polypropylene and wool at recommended dilutions. Available in 5 and 20 litres. 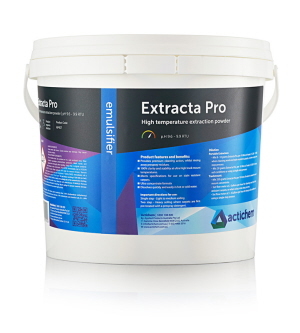 Extracta Pro is Actichem's premium quality emulsifier solution which provides powerful cleaning and rinsing action with ultra heat stability. It provides premium cleaning action whilst rinsing away prespray residues. It offers highly economical dilution ratios. It dissolves in hot or cold water quickly and easily. It meets specifications for use on stain resistant carpets. Available in 1, 4.5 and 20 kgs. Actichem Rinse Pro has a premium cleaning action and neutralisation of prespray residues. 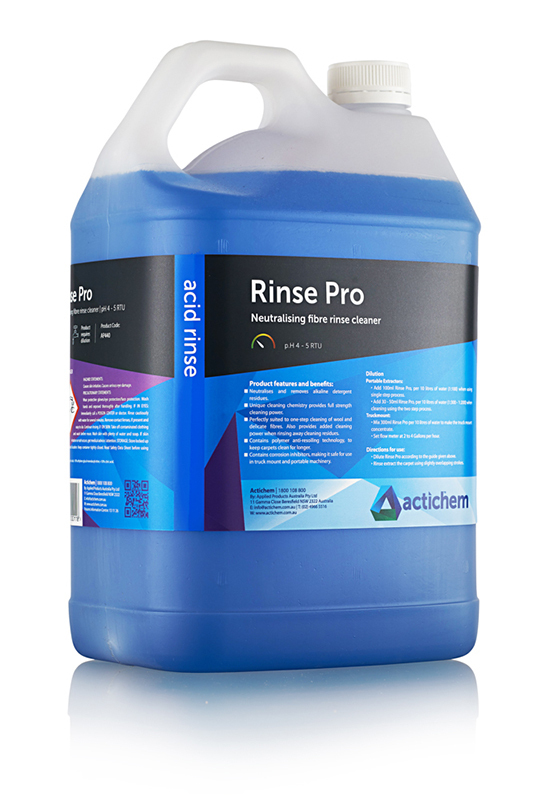 Actichem's Rinse Pro, a unique dual purpose acid rinse which incorporates anti-resoiling polymers to give you powerful cleaning and pH neutralization. It neutralises and removes alkaline detergent residues. It helps prevent browning and stabilises dyes. It has corrosion inhibitors which is safe for use in truck mounts and portables. It is ideal for single step cleaning of wool and delicate fibres and for added cleaning power when rinsing away residues. It has a fruity cinnamon fragrance. Available in 5 and 20 litres.